Under a presidential administration that’s catalyzed several nationwide protests, echoes of chants and speeches cluttered the Boston Common Friday, as Boston University’s School of Music and the BU Arts Initiative explored the idea of protesting without words. 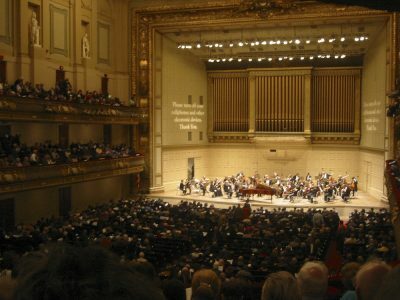 The panel served as a prelude to a concert, Protest without Words: the Arts & Social Change, at Symphony Hall on Monday night, which featured Boston University’s Symphony Orchestra, Wind Ensemble and Symphonic Chorus. The opera follows the storyline of John Brown, a 19th-century abolitionist known for his radical views. When Mechem started researching Brown, he found the historical figure to be very different from the fanatic some history books and other texts had made him out to be. Kerri Greenidge, co-director of the African American Freedom Trail Project, volleyed off of Mechem’s story by stressing the importance of context when creating art. Whether an artist is creating a historical piece or not, the person should understand what has already been made, she said. The three panelists agreed that art is always political. They said that even works coined to be non-political are making a political statement. When trying to include political context in pieces of art, Greenidge recommended that students seek out primary sources to learn information without the filter of an author’s bias. Harvey Young, dean of the College of Fine Arts, said now is an especially great time for art. Young said he finds the internet’s potential impact on the arts to be exciting. Kennedy related the greater proliferation of art to more representation. “There’s more of a room for different stories, narratives, that were suppressed before,” she said. Greenidge sees ambition in her students to create art with political messages, but she said younger artists sometimes lack context –– whether historically or politically –– to create pieces that can stand the test of time. Michael Fang, a freshman in the College of Arts and Sciences, sang “Songs of the Slave” in the chorus at the concert. He said he appreciated Mechem’s inclusion of American styles. “I think Mechem has continued to promote (as previous US composers like Gershwin did) uniquely American culture into the classical genre by incorporating spiritual and gospel music in his opera,” Fang wrote in a message. Young said art is so powerful is due to its ability to create a community and common bond.